Now that you are engaged, it is time to start planning your dream wedding, and the most important part of the wedding and the first thing you must choose before anything else is your wedding venue. Your wedding venue has to be a place you would love to have your wedding at, a place you can imagine celebrating the best day of your life in. And you are super lucky if you are getting married in Lebanon, as it considered one of the most beautiful countries, and it has some unique nature and magic to it. 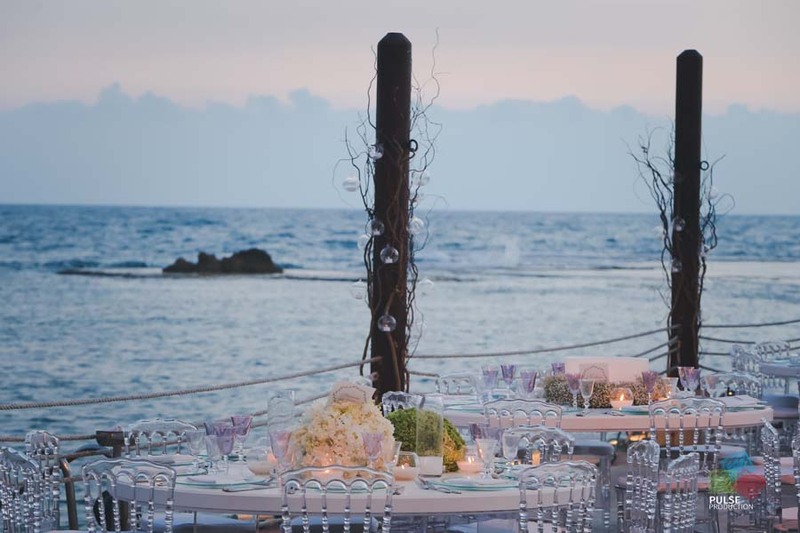 Lebanon offers some amazing and unique venues and places that make amazing wedding venues, whether you are looking for a beach wedding venue, a grand ballroom, a spacious outdoor wedding venue, you won't be disappointed! 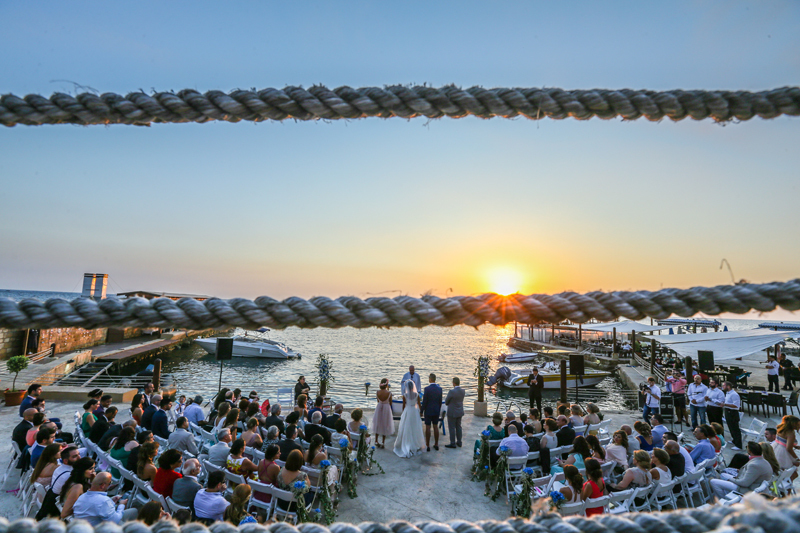 But just like any other beautiful country, it is not easy to find the right wedding venue among all the options it has to offer, this is why you should start narrowing down your choices to make it easier for you to find your wedding venue. Start by choosing the type of wedding venue you want for your wedding, such as a garden wedding, a beach wedding, or an indoor wedding. 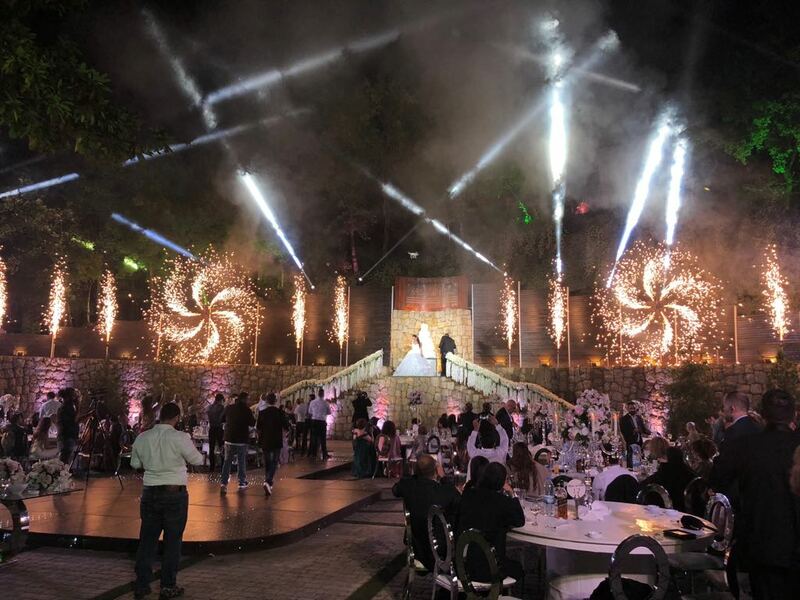 If you want to have an outdoor wedding in Lebanon, then you came to the right place, because we bring you the top outdoor wedding venues in Lebanon. In the heart of the scenic town of Beit Mery, only 15 km from the urban jungle of Beirut, is the quintessentially Lebanese Al Bustan Hotel. 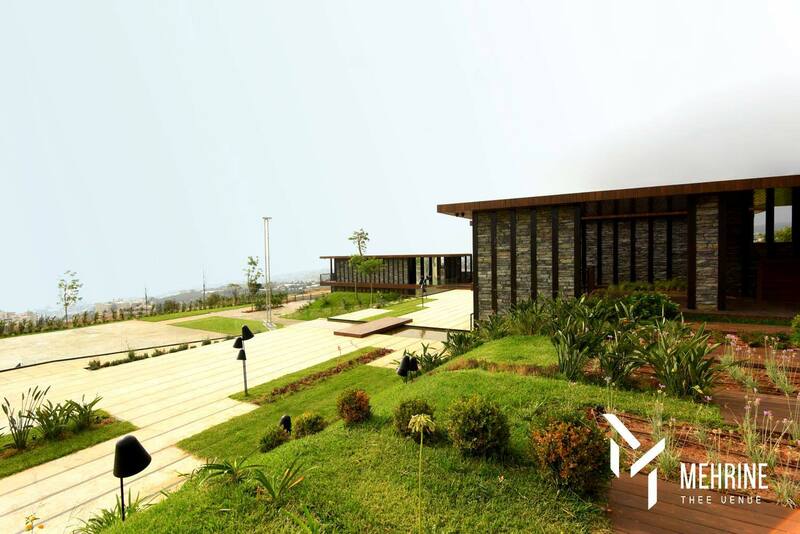 Its founder, Emile Bustani, wanted to build a hotel to treat the world and his international friends to the finest authentic Lebanese hospitality. For over half a century, the hotel has been a Lebanese landmark, lovingly run by 3 generations of the Bustani family. Steeped in family tradition and heritage, Al Bustan is imbued with a grand spirit. 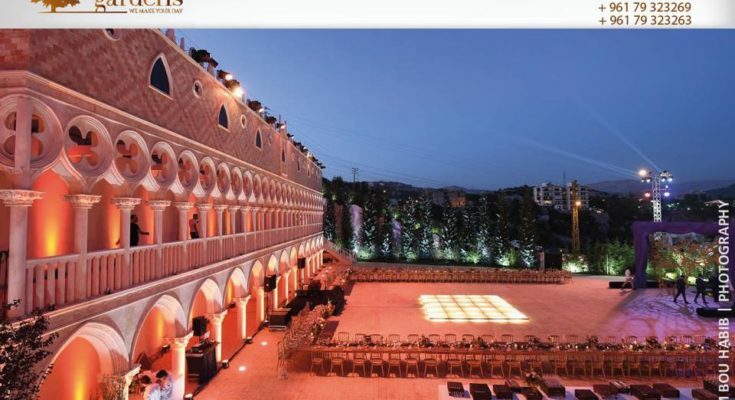 Majestic weddings are flawlessly staged in the Grand Hills Hotels exquisite settings. 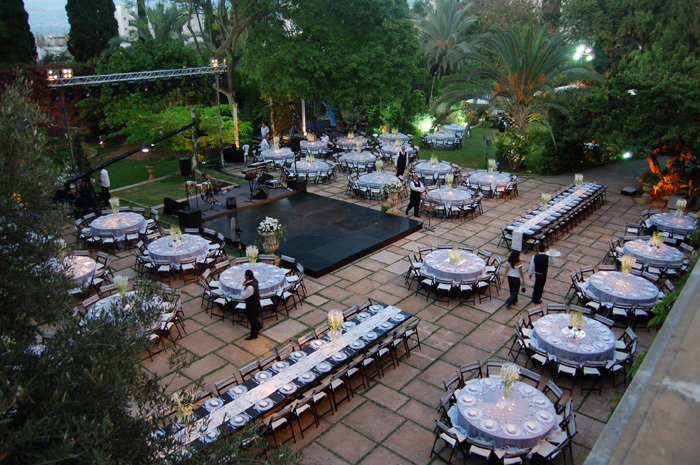 With fabled gardens and palatial ballroom experience, your event will be organized with an unrivaled attention to detail. Grand Hills offers a luscious epicurean selection of indulging menu options. Built-in 1860 by Moussa Sursock, Sursock Palace was recognized at the time as one of Beirut's grandest townhouses and is today certainly the largest private palace of that period to survive intact, with its surrounding lush gardens, as a family home. 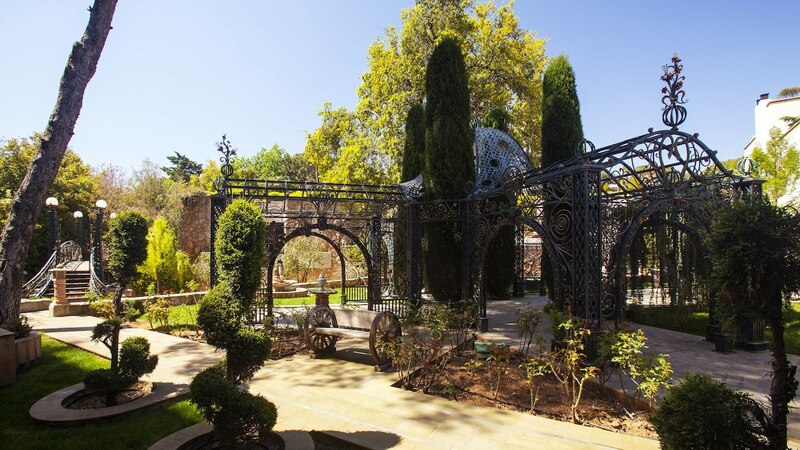 One important and deciding factor is that the gardens are hired as a whole for 24 hours, which means total privacy and more than enough time to set-up and break-up the wedding set up. Effectively, and unlike most other venues, there will be only one function at a time and normally all day to get prepared. Exquisitely located at the edge of the sea, and at the most prominent spot of Byblos Harbor, Byblos Sur Mer hotel provides privacy and serenity in a truly charming setting and offers its guests the comfort of a home at the heart of a legend. 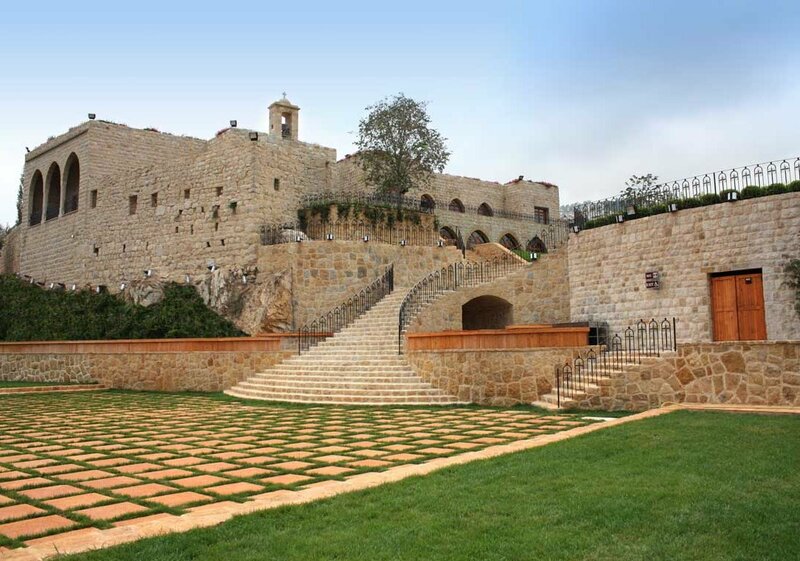 Byblos Sur Mer overlooks the ancient Byblos port and castle on one side, and a panoramic view of the Mediterranean sea on the other, in a carefully decorated space furnished with local art and artisanal wares, ancient relics, and precious items from private collections. 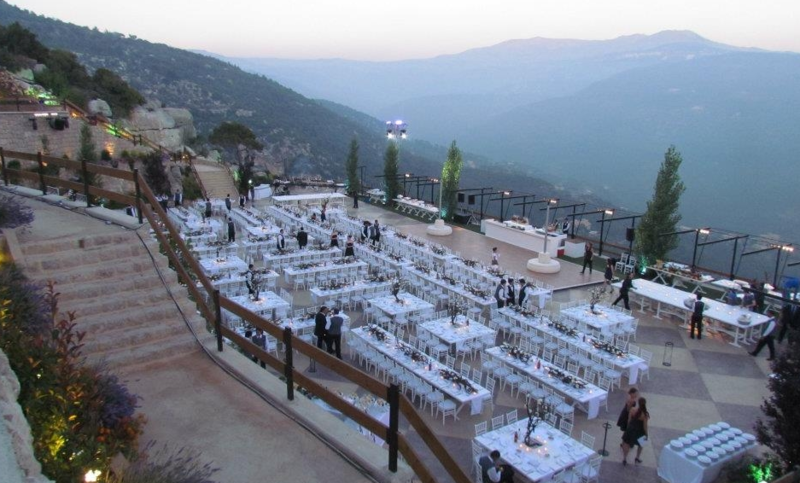 Nestled perfectly between the lush valleys of Mount Lebanon, Domaine de Zekrit has seen the rise and fall of great empires dating as far back as the Phoenician Era whose remnants can still be seen around the venue. Divided into 2 levels, Domaine de Zekrit allows up to 1400 guests to be comfortably seated with every seat boasting the best view in the house. 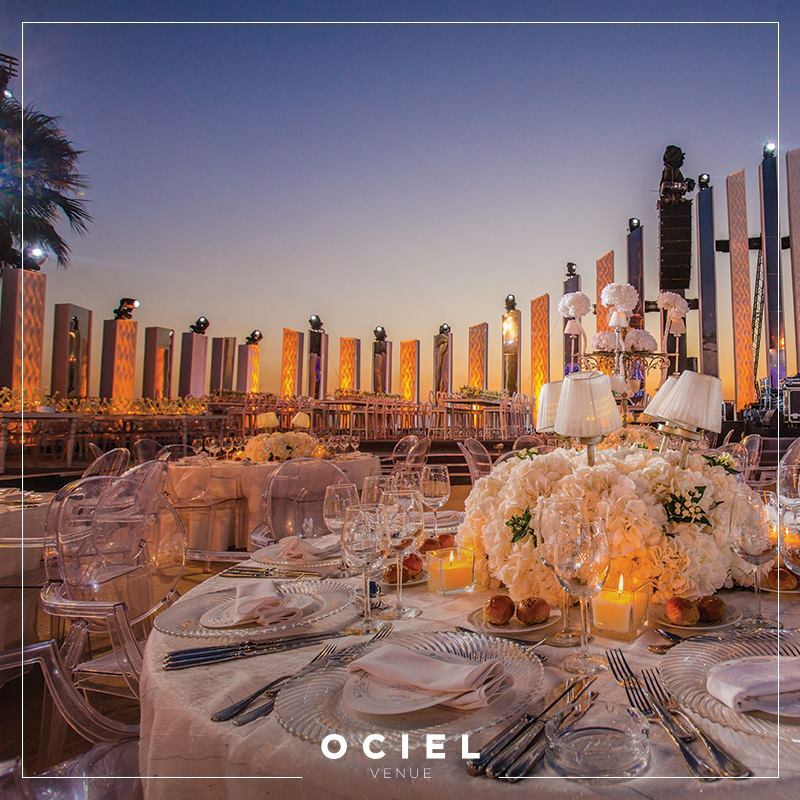 Blanchic is a modern outdoor venue, designed to host all kinds of events from weddings and engagements to entertainment and fashion shows. 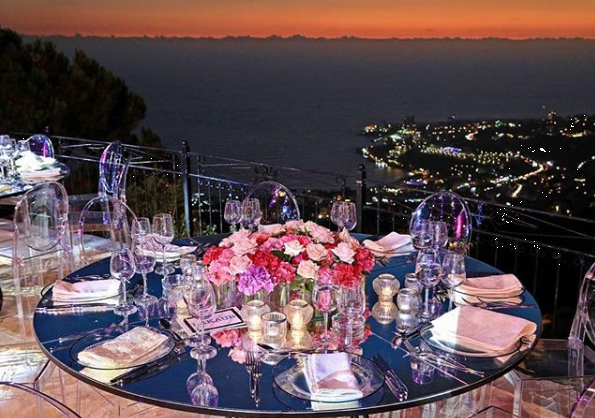 Perched on the edge of a mountain cliff in Baabdat, the venue reveals its charm to the virgin mountains of the Metn area, creating an unparalleled mood and a humidity-free atmosphere. Across the 10,000 m² of Blanchic, there's no room for compromise: They offer a Welcome Drinks patio, Bridal Room, Ceremonial Grounds, and a Reception Area to accommodate up to 800 guests. 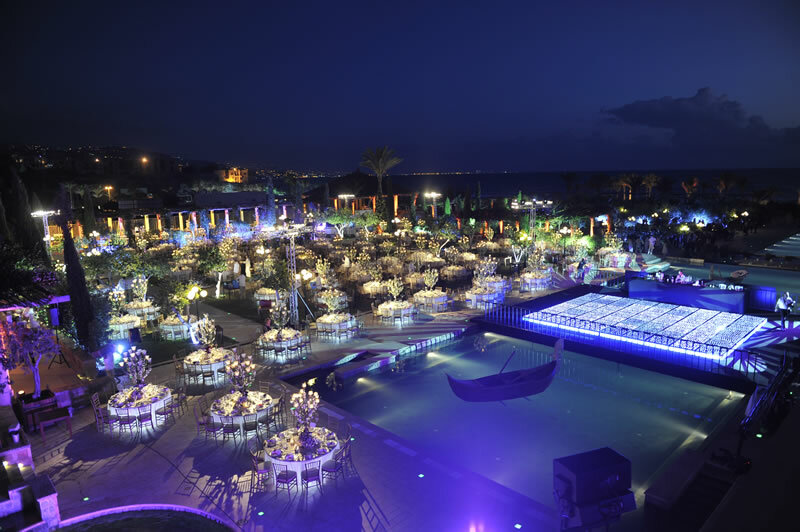 It is the place where you can turn your dream into an astonishing reality, Mehrine Thee Venue in Jbeil has been carefully created to meet your deepest desire and highest request. This place combines in a dignified way the 4 essential life’s elements: Earth, Fire, Water, and Wind. You shall discover a magical space out of the bountiful gift of nature: it is a haven of peace where space itself makes you feel the life-giving universe sense. In this infinite landscape, you enjoy the great panoramic view of the horizon defining the borderline between heaven and earth. The Venue is a guarantee for making your event an everlasting memory, it creates the perfect state to enjoy each and every moment of your special occasion. Blanc de Chene in Bikfaya is the wedding empire project launched by EWE which provides a full solution of services regarding your wedding. If you are searching for a wedding venue or searching for a catering company to serve you or a wedding planner to plan it, you will find it all here. 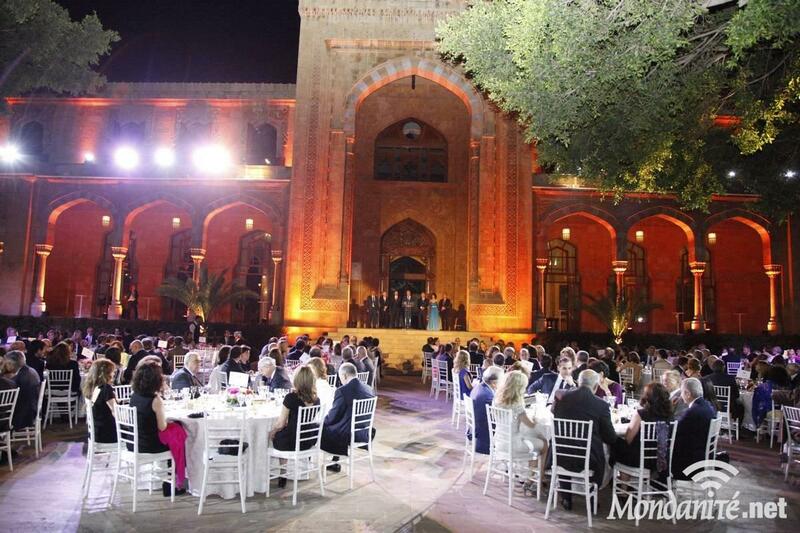 First comes the venue, which is considered one of the best in the Middle East by all who have seen it. 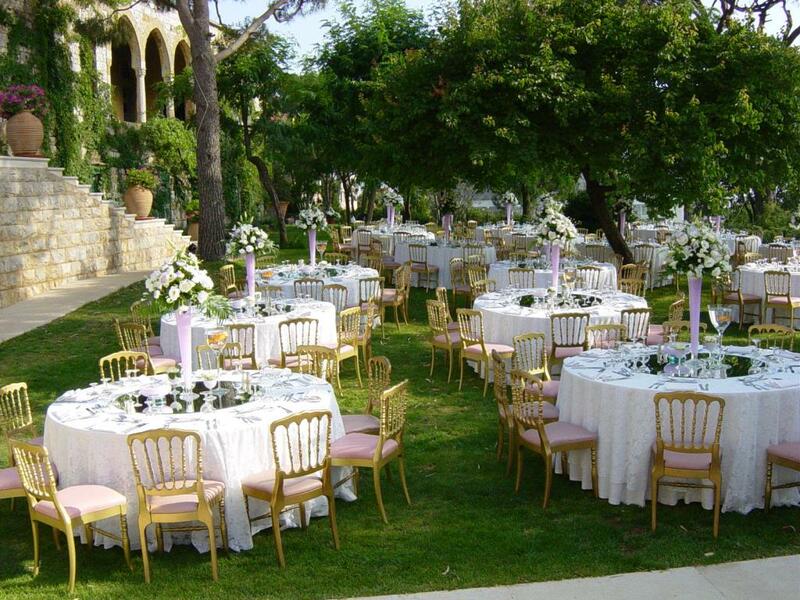 With a charming surrounding panoramic view, the enchanting greenery around, the many scenic spots on location, and just the perfect breeze during Lebanon’s summer heat, your dream wedding at Blanc de Chene will certainly be magical. 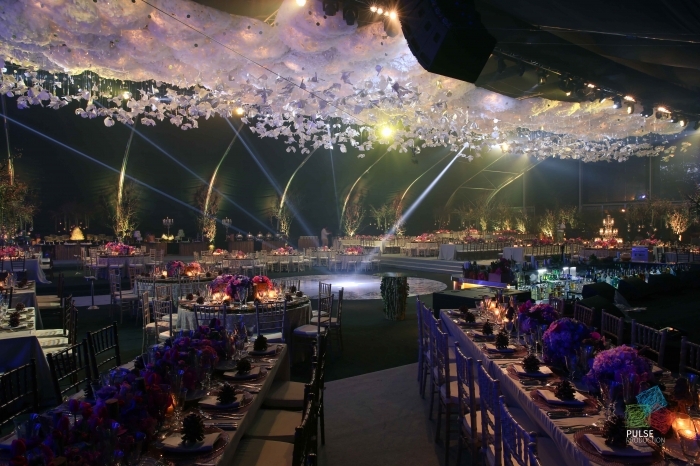 Choosing the perfect wedding venue is one of the most important decisions to make when planning a wedding. The venue needs to be romantic, unique, with beautiful landscapes for your wedding photographer and also offers comfortable accommodation for your guests. The Venezia Gardens in Faitroun offers you all of this and more.